So graduation is coming. It is time to summarize your school time and say goodbye to your friends and teachers. So many students like taking photos with friends to record best memories. A good way to share and preserve these special photos is to create a graduation slideshow DVD or slideshow video , whenever you see the slideshow, you can remember your best friends and precious school life. Also we can make a graduation slideshow to showcase your growing up experiences with photos from childhood to graduation. To make a graduation slideshow DVD(video), DVD Photo Slideshow can be a good choice. 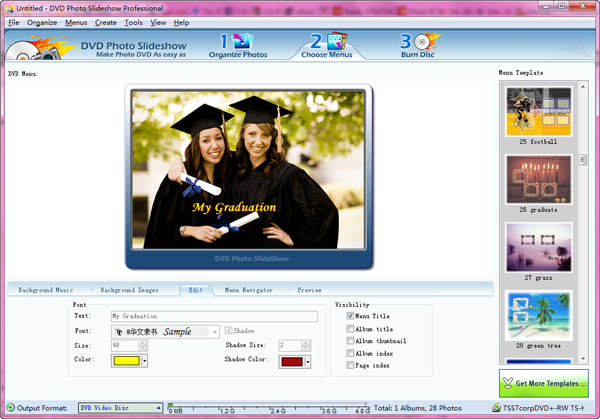 It enables you to create a graduation slideshow with photos, music, transitions, pan/ zoom effects and other effects. Click Organize Photos tab. Then drag photos to Album Photo area to begin making the graduation slideshow. Then you can personalize the slideshow with text, transitions, subtitles, theme are more. There are a bunch of transition effects for using between slides, such as Alpha Blend, Hear Iris, Star, etc. You can select transitions for each slide . The graduation slideshow maker allows you to add multiple songs as slideshow music, even trim songs. You can sync slideshow to music to keep them play in pace. Click the Text button under sub-tab Album Photo, you can add text and subtitles to describe your photos. Go to sub-tab Album Theme, you can select a graduation theme for your graduation slideshow. After that you can change to Album Preview to preview the slideshow to see if it is satisfying. If not, go back to continue customizing your graduation slideshow. If you do not want to burn the graduation slideshow onto DVD,you can skip this step. Click Choose Menus tab, you can see many beautiful theme templates on the left of the screen. Select one menu template for your graduation slideshow DVD and customize it with background music and image. Then edit the menu title,visibility and menu navigator. Select Play current album repeatedly, the graduation slideshow DVD will play in continuous loop when playing on TV. 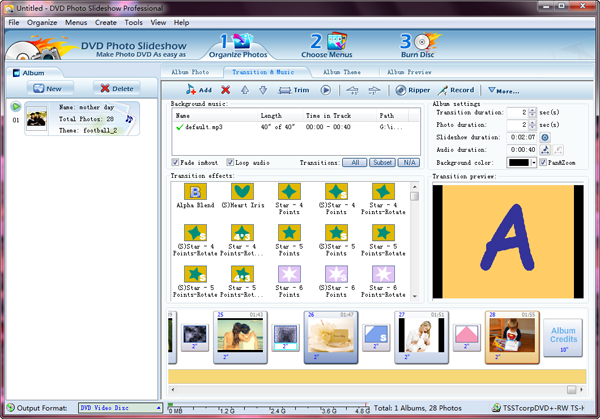 Now switch to Burn Disc tab to output the graduation slideshow. Click Output Format drop-down list, you can see all the formats in which you can save the slideshow. 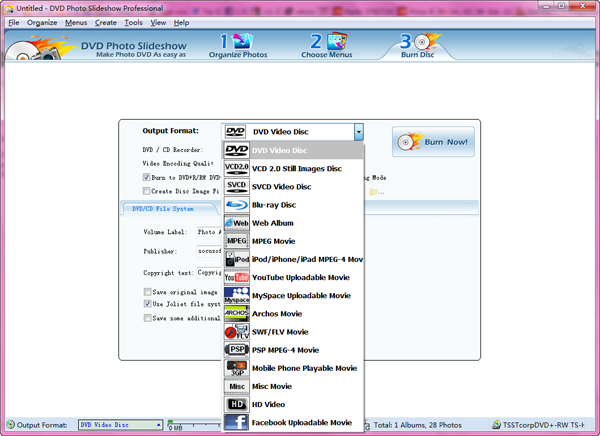 You can burn the graduation slideshow onto DVD / CD or Blu-ray Disc, or save it as a video format in multiple formats, such as mp4, mov, avi, flv, swf , for playing on iPad / iPhone / iPod / PSP / Archos / Android device. Or you can create the graduation slideshow for sharing on YouTube, Facebook and Myspace. This entry was posted in DVD Photo Slideshow and tagged create graduation video slideshow, graduation slideshow maker, make graduation slideshow, slideshow software to make a graduation slideshow with music on April 27, 2013 by Sarah Jablich.